BALTIMORE (CNS) — The U.S. bishops’ effort to send a pastoral message of hope in trying economic times came up short of the votes needed Nov. 13, after concerns were raised about its limitations, its expedited process and whether it actually was something that they would use to reach out to people. 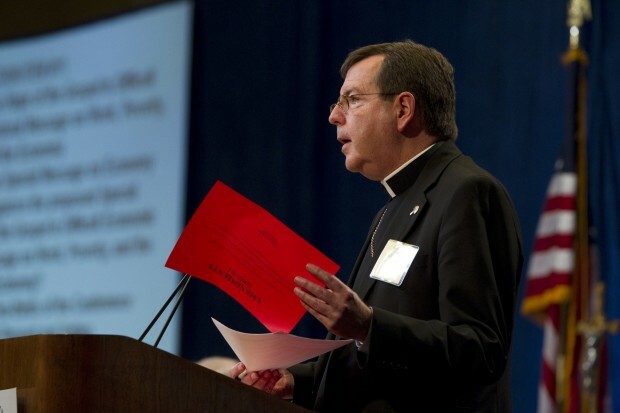 With the vote of 134 to 98 and nine abstentions falling short of the 152 needed for the two-thirds required for passage, “The Hope of the Gospel in Difficult Times: A Pastoral Message on Work, Poverty and the Economy” was set aside on the second day of the bishops’ annual fall general assembly in Baltimore. “There’s no sting, no bite to this,” said retired Auxiliary Bishop Peter A. Rosazza of Hartford, asking for it to be set aside. He noted that there had been no consultation with an economist in the document’s preparation, as requested when the message was commissioned. At their June meeting in Atlanta, by a vote of 171-26, the bishops had asked for “something more than a public statement” to express their concern about poverty and the struggles of unemployed people. At a press briefing immediately after the session, New York Cardinal Timothy M. Dolan, president of the bishops’ conference, said it would take a while to digest why the message didn’t pass, but said he’d learned a lesson about not following the usual processes of the conference. “Whenever we bypass the process, we get burned,” Cardinal Dolan said. A formal statement of the bishops’ conference typically is a multiyear, or at least a full yearlong process. He said if he’s asked to bypass the usual process for a statement again, he’d certainly say no. “This has not yet reached the level of excellence that we hope would be well received,” said retired Archbishop Joseph A. Fiorenza of Galveston-Houston. Bishop Cupich said the situation “goes to the issue of process,” because both the committee doing the writing and the bishops being asked to approve it were rushed. “It puts you under the gun and it’s unfair,” he said. “I’m sorry the process got in the way,” he added.